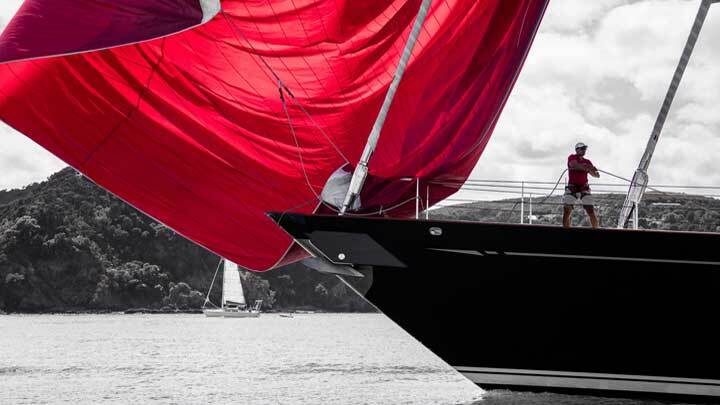 The annual New Zealand Millennium Cup ranks as the first superyacht race of the calendar. What’s more, given the typical weather conditions, New Zealand ranks as an ideal host. The Millennium Cup 2019 edition proved to be exactly as expected, though still with a few twists for good measure. 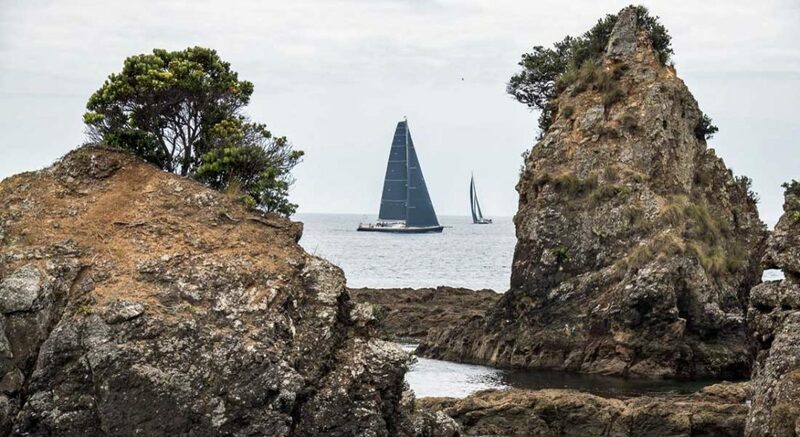 Last week, from January 30 to February 2, five sailing superyachts set their sights on a triumphant taking of the Cup. Unfortunately, day one saw a competitor have to withdraw. Sassafras, which has participated a few times in recent years, encountered technical troubles. Happily, though, she did still manage to start and finish the first race of that day. In fact, she crossed the finish line just eight seconds behind fellow challenger Freya (below). That race saw a moderate breeze, with lead changes throughout. 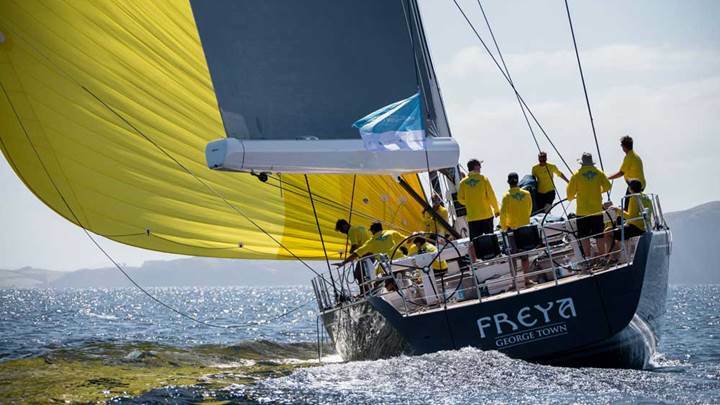 The second race of day one of the Millennium Cup 2019 edition was longer and a bit more challenging. Or, so the course designers thought. Thalia won on corrected time, a triumphant turnaround compared to race one. Kite issues resulted in her finishing last in the first race. Day one results: Tawera (a previous winner) and Freya tied for first, followed by Thalia and Silvertip. Light-air challenges befell all the competitors the following day in the first race. As the race’s official bloggers put it, it “was a perfect example of varied New Zealand racing.” Undeterred, the racers made the most of it, with Tawera again taking first on corrected time. Freya followed, with Thalia (below) in third. She did, however, incur a time penalty of five minutes and four seconds, since she crossed the start line early. Silvertip finished in fourth. Maybe the improving conditions for race two benefitted Silvertip’s crew, as she took third with aplomb. But, once again, Tawera and Freya proved tough to beat, taking first and second place, respectively. Overall, Tawera proved truly tough to beat. Despite Freya and Silvertip rounding marks with perfect precision on day three, Tawera was unstoppable. She emerged victorious, taking the 2019 Cup. It’s worth noting that the Millennium Cup 2019 was the 11th running of this regatta. It’s also worth noting that the world’s most southerly superyacht race has changes in store for the future. Expect to see some of the J Class Association members compete in 2021, for example. The Marina will have a Fuel Dock, Complete Convenience Store on the Fuel Dock. The Fuel Dock will be over 250 Ft. long, with Electric Carts that take Customers around the Marina. The Shipyard will be hidden from the Hotel, and Clubhouse. There is another hour of info i have on this Marina / Sailing Center. The Sailing Center will have at least 3 fleets of Racing Boats. One Catamaran Fleet of Nacra 5.2 or similar Size. No Foiling boats. The next will be C&C 30 Custom Race boats built in the USA. All boats built in the USA. The next fleet will be Custom 40 Ft. Boats Built by An American Boat Builder – TBD, These would replace the Catalina 37’s that are used by Long Beach Yacht Club for One Design Racing here in CA. I know both CA, New England, -Chesapeake Bay and Florida Sailboat Racing very well.. I have raced all over in the USA since 1967 until 2015. I am currently Retired in So. Calif. Please contact me and i will tell you more about my Superyacht Marina / Shipyard & International Sailing Center.. It would be much like what Oakcliff Sailing Center has done with Dawn Riley as CEO on Oyster Bay, NY. I know her, and she had accomplished so much with Oakcliff Sailing Center. My name is Lloyd E. Stowe, Jr. ( Les Stowe ) i prefer Les.. The Marina would be exclusive for Yachts over 100 Ft. or close.. WE want to keep like minded people together. This would have a Security Gate to come into the Marina.. This would be a Secure Zone, with high Walls, covered in Shrubs, Greenery , and with large Towers, manned and a 800 Mhz. Radio System thruout the Marina with Armed Guards.. Concealed Arms !!! in Street Clothes, and with our Nice Shirts.. they look like Employees of the Marina. Also, if we have the land, We would like to build nearby, a Full Service small Pleasure Boat Marina, with small Shipyard.. The Marina Capacity of just over 300 will support its own Shipyard.. we had 215 slips in MD, and it would support our 30 Ton Travel lift and Winter Storage would keep the Marina afloat during the winters and winter storage fees would pay everyones salary during the winters, plus inside work tickets too. I know this, and i have managed marinas like this. With a small Dry Stack Storage Building of 250 to 300 Inside stored Boats, with a Fork Lift of 30,000 lbs. This would be in the Black in 2 yrs.. i know that because i did the Research for inside Storage New Builds in MD.. They work. I have run a 28,000 lbs Wiggins Fork lift with 40 ft. Forks on the machine.. it’s a really nice machine. I would be happy to discuss all of this with you. I am available to start this project asap as you want me to move and get this rolling. I have so many good ideas to get this going. More with Mast Lofts, and recruiting Hall Spars for a West Coast service Center for a Mast Mfg.. here or anywhere you want to build a Marina.. I can talk about this for days.. just please let me talk to you or someone that is interested in Discussing the Future of Boating and Superyachts Worldwide.